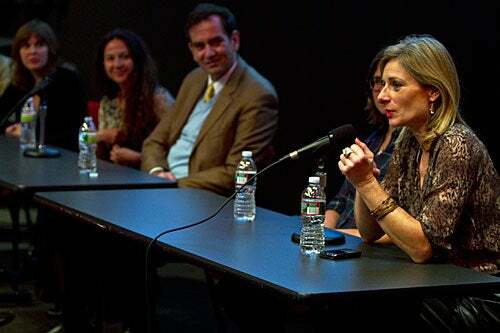 Lisa Randall, a Harvard theoretical physicist, curated the show with artist Lia Halloran, asking contributors to develop works that examined scale. The resulting exhibition features contemporary works that include a video installation, photography, and a social experiment involving cupcakes. Breaking down heady scientific concepts is Lisa Randall’s specialty. The Harvard theoretical physicist, an authority on both the study of the minute, such as the building blocks of matter, and the massive, like the makeup of the universe, has written works that help to demystify the worlds of cosmology and particle physics. Now the dark-matter guru is illuminating science with art. In “Measure for Measure” a new exhibition at Harvard’s Carpenter Center for the Visual Arts, Randall and eight Los Angeles-based artists dive into the artistic and scientific notion of scale. It was while Randall, the Frank B. Baird Jr. Professor of Science, was finishing her new book that the Los Angeles Art Association asked her to curate a show. Randall chose to develop the exhibition around the idea of scale, a subject much on her mind, and a vital concept for artists and scientists alike. Randall curated the show with artist Lia Halloran, asking contributors to develop works that examined scale. The resulting exhibition features contemporary works that include a video installation, photography, and a social experiment involving cupcakes. The show debuted at the Los Angeles association and then moved to the Guggenheim Gallery at Chapman University. This isn’t Randall’s only foray into the art world. Two years ago she collaborated on her first opera with the Spanish composer Hector Parra, who asked her to write a libretto based on her theory of extra dimensions to the universe. The result, “Hypermusic Prologue: A Projective Opera in Seven Planes,” premiered at the Pompidou Center in Paris in 2009. Each piece in the new exhibition engages viewers in dynamic, sometimes difficult ways. Barbara Parmet’s work, “Redwood With Floating Pine Needles,” challenges the notion of scale with a dizzying photograph of a giant Redwood tree that extends from floor to ceiling. Adding her clever twist on scale is the work of artist Susan Sironi, called “Actual Size: A Self Portrait in Four Parts.” Using classic tales that play with scale, like Lewis Carroll’s “Alice’s Adventures in Wonderland” and Jonathan Swift’s “Gulliver’s Travels” as her base, Sironi carved into the books tracings of her hand and foot, her profile, and a cross section of her neck. Perhaps the most surprising take on the show’s theme is the work of Elizabeth Tobias, who explored the concept of economic scale. Over several months, Tobias hit the streets of Los Angeles, asking people to jot down on an index card their thoughts on hunger and poverty in return for a cupcake. The show, on view through Dec. 22, is made possible with support from the Provostial Fund for Arts and Humanities at Harvard University.